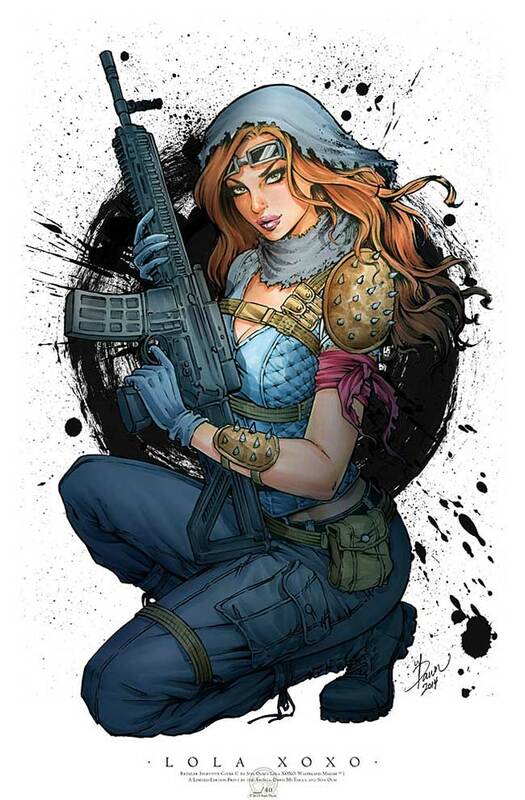 Aspen Comics will be attending WonderCon 2015 in Anaheim, CA this weekend, April 3rd through the 5th. The publisher will be located at Booth #501, as well as participating in panels and portfolio reviews throughout the convention. 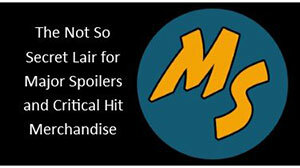 Guests in attendance will include Frank Mastromauro (Shrugged), Peter Steigerwald (The ZooHunters), Vince Hernandez (Lola XOXO: Wasteland Madam), Mark Roslan (BubbleGun), Scott Lobdell (The Four Points), J.T. Krul (Soulfire), Tom Hutchison (Big Dog Ink) Josh Reed (The Four Points), and David Wohl (Fathom), all of whom will be available at the booth to greet fans and sign comics. 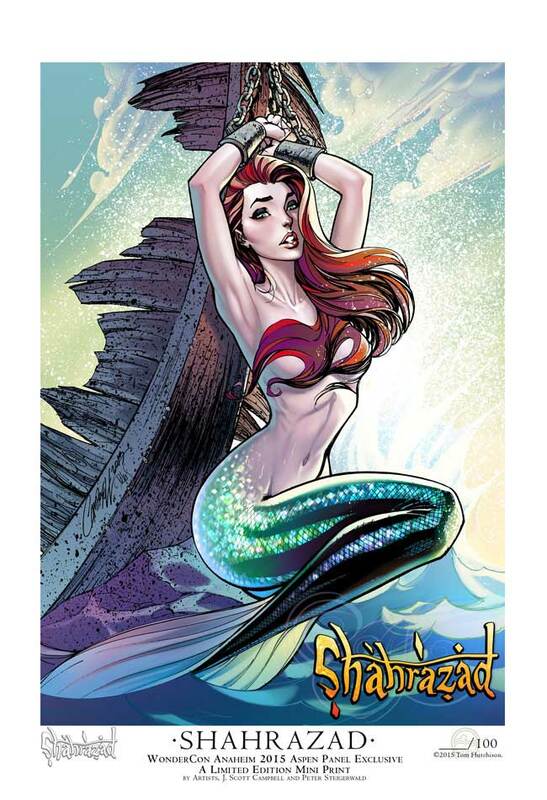 There will be a The Four Points #1 WonderCon 2015 exclusive variant cover by V Ken Marion and Peter Steigerwald available for purchase, as well as the popular Shahrazad #1 Shannon Maer Convention Exclusive variant. 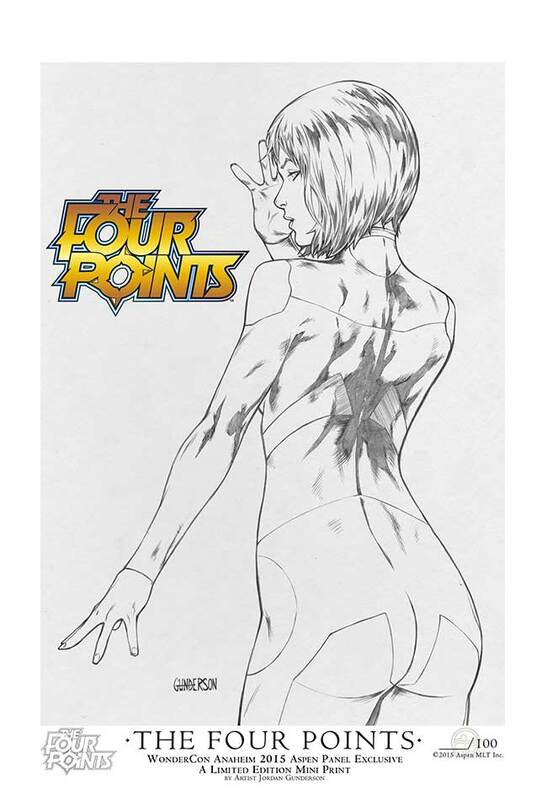 WonderCon will be the world premiere of The Four Points #1. Fans can get their copy at the Aspen booth this weekend before the series hits stores on April 8th. 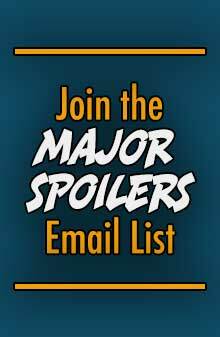 Series scribe Scott Lobdell will be signing issues at the booth throughout the weekend. As well, the publisher will have a small quantity of the nearly sold out Lola XOXO: Wasteland Madam #1 Emerald City Comicon 2015 cover by Siya Oum available, a title which will also debuts early prior to its April 8th release only available at the Aspen Booth 501. Aspen will also be bringing a selection of their industry leading art prints, including a full size print of The Four Points #1 WonderCon 2015 exclusive variant by V Ken Marion, a Shahrazad #1 full size print by Mike DeBalfo, and a Lola XOXO: Wasteland Madam #1 full size print by Dawn McTeigue. Limited quantities of all convention exclusives will be available on www.AspenStore.com following the event. Get details on all of the projects Aspen has planned though 2015, ask the creators questions about their yet-to-be released books, and get two exclusive free mini-prints at the end of the panel – a The Four Points #1 Aspen Panel Exclusive mini print by Jordan Gunderson and a full color Shahrazad #1 Aspen Panel Exclusive mini print by J. Scott Campbell and Peter Steigerwald (while supplies last). Comic book industry veterans discuss what it entails to be an inker, letterer, or colorist, along with advice for those aspiring to be part of the comic book industry. Editor-in-Chief Vince Hernandez and Assistant Editor Andrea Shea will review artist portfolios and offer critiques for artists looking to break into the industry. 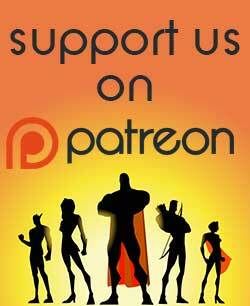 Aspen MLT, Inc. is an entertainment publishing company founded in January 2003 by superstar comic artist Michael Turner. 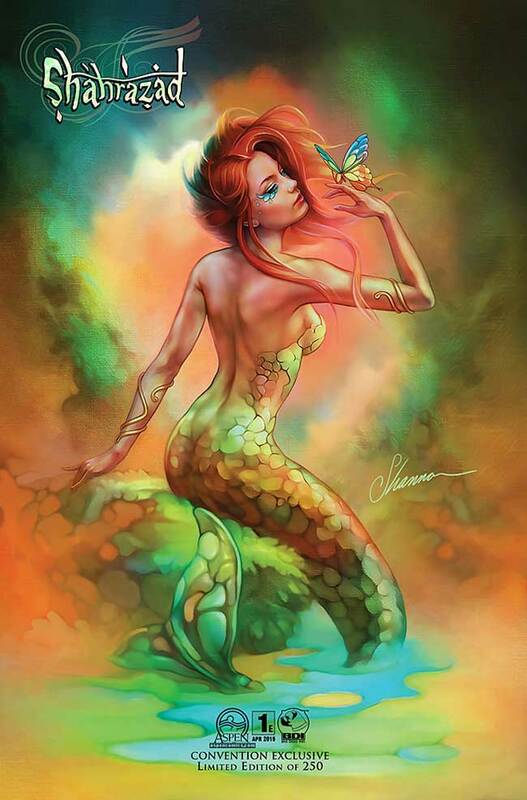 Priding itself on producing entertainment properties of the highest quality visual and storytelling elements Along with their own successful properties such as Fathom, Soulfire, Lola XOXO, Executive Assistant: Iris, Charismagic, Jirni and more. Aspen also collaborates with the comic industry’s most successful companies and endeavors including Marvel Comics and DC Entertainment. 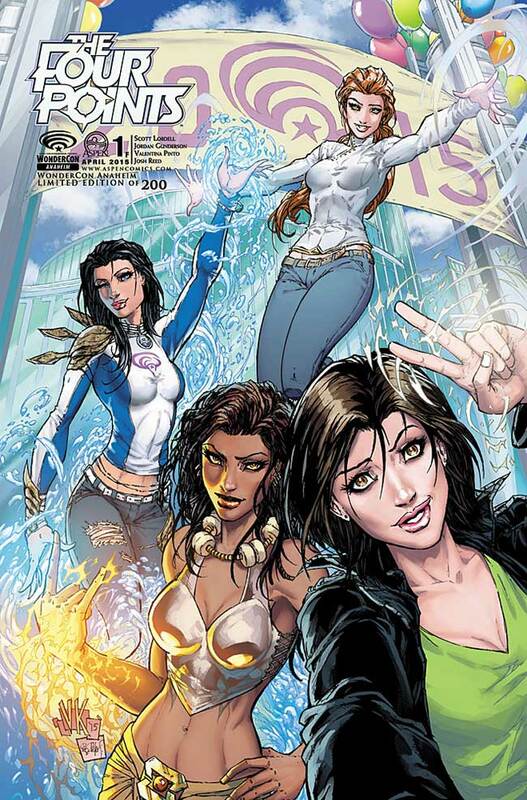 Aspen has collaborated with Marvel for various hit projects, including cover work for the best-selling events Civil War, World War Hulk, and Ultimatum. Aspen collaborated with DC Comics to provide covers for such best-selling titles as Superman/Batman: The Return of Supergirl, The Justice League of America, and Eisner-nominated covers for the critically acclaimed, best-selling Identity Crisis series. In 2006, Aspen joined forces with television giant NBC to create the online comic adaptations for the hit television series Heroes. In 2012, Aspen teamed up with Gale Anne Hurd’s Valhalla Entertainment to produce the horror-adventure series Dead Man’s Run, as well as collaborating with director McG’s Wonderland Sound and Vision to produce the horror comic Haunted City. Aspen also produced the one-of-a-kind Anarchy digital graphic novel for the popular body spray company, Axe. In 2014, Aspen added fellow publisher, Big Dog Ink, as its first collaborative imprint.